Being an Owner means you get to vote and you get free stuff every month, in addition to other benefits and positive impacts for you, the Co-op, and our community! Learn more about Ownership below. When you’re ready to sign up, stop by the store and pick up a sign up card at the front registers! How Does Being an Owner Benefit Me? Own a grocery store, vote, get free stuff, make a positive impact on your community. Something as simple as your grocery shopping can have a big impact. This is your place. When you own it, you get free stuff. Every month, it’s something new: chocolate, coffee, tote bags and mugs. Owners elect the Board of Directors. You help shape what the Co-op cares about and how those goals are accomplished. You can vote, and you can run if you want. Owners share profits! When the Co-op makes a profit, every Owner receives a split in proportion to their store purchases. How Does Ownership Help the Community? The Co-op exists for Durham. The Co-op invests in the local economy. 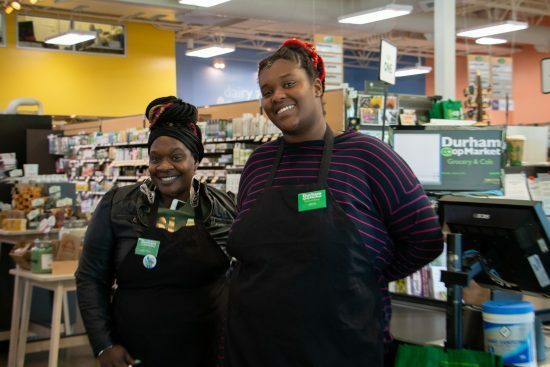 Every dollar spent at the Co-op returns revenue back to the community. We grow together! The Co-op supports local businesses by carrying products from local farmers, artisans, and culinarians. We love fresh food! The Co-op provides jobs! We hire from the community so our business is run by and supports the people of Durham. The Co-op’s success enables us to support efforts and causes in the area. The Co-op donates to local organizations that are working to nurture the community. We care about our neighbors! How Does Ownership Benefit the Co-op? The Co-op wouldn’t be here without you and the 4000+ other Owners, all from NC! The Co-op needs your perspective, input, and accountability to thrive. The Co-op exists to serve and support Durham, and your participation helps guide the Co-op’s future and influence. You help us live our values! Cooperatives provide a sustainable, economic model for business. Existing for everyone’s benefit means we can be more resourceful and stick around for a long time. You are key to the Co-op’s success! The Co-op offers Food For All Ownership for customers who qualify for SNAP and other benefits. FFA Ownership costs $15 upfront and is paid off in full through dividends. FFA Owners receive all rights and benefits of being an Owner in addition to a 20% discount. Verify your SNAP eligibility when you sign up to be an Owner! Ask a cashier for a FFA Ownership form to learn more and sign up. • Creating an open, inclusive, and diverse store that welcomes our community. • Making high-quality, nourishing food affordable and accessible. • Supporting the local economy and local food systems. • Modelling environmental sustainability in our practices and products. • Fostering a healthy workplace based on dignity, opportunity, and fair compensation. These are the values the Co-op is dedicated to pursuing. We are guided by these ends in an effort to sustain lasting, positive impact in the community. As an Owner, your role is an essential part of that process.